Construction Begins On Guardians Of The Galaxy: Mission Breakout! Walt Disney once said, “Around here, However, We don’t look backwards for very long. We keep moving forward, opening up new doors and doing new things because we’re curious. And curiosity keeps leading us down new paths.” He also famously said that Disneyland will never be finished, words that are at the core of Guardians of the Galaxy: Mission Breakout! According to comicbook.com, construction on the Guardians of the Galaxy ride began a few days ago. Fans of Disneyland however know that the park has been gearing up for the transformation of beloved fan favorite ride Tower of Terror into Guardians for months. From the removal of the “Hollywood Tower Hotel” sign to the covering of the building in tarp, Tower has become “The Brick” Which will soon be transformed into the collector’s mansion. 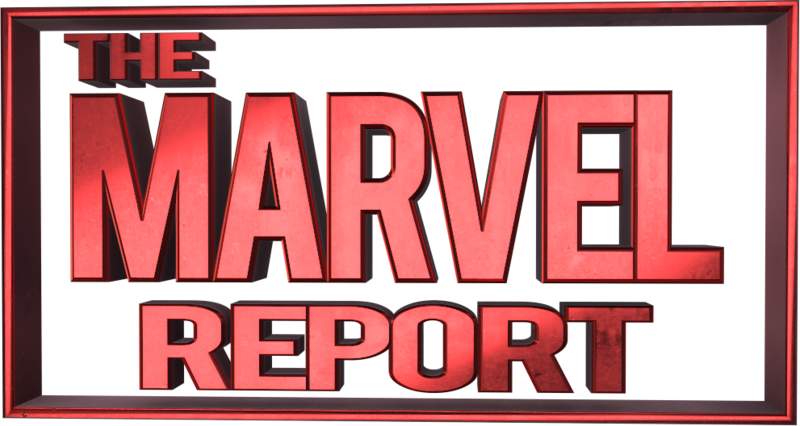 Fans will remember the announcement of the revamp at Comic Con – an announcement that was met with disdain from most die-hard fans of Disneyland. The park sent the Tower Hotel off in style however, partaking in a months long celebration of the beloved ride that included performances, a “final check-out” where you could ride the ride in darkness, themed food offerings in nearby Buena Vista Street, and more. They concluded the event on the 2nd with a “final check out party” where, for the price of 95 dollars fans could experience the Tower Hotel one last time and get a special keepsake of the event. 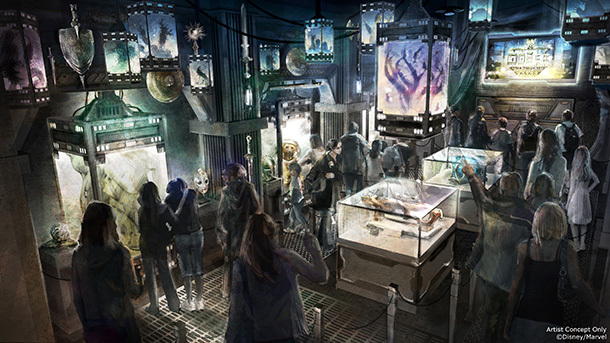 Guardians will offer a similar premise to the Tower Hotel. 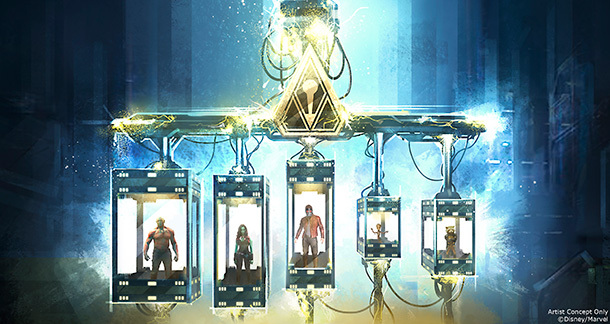 Guests will be invited into the collector’s mansion wherein they’ll be able to view the “jewel” of his collection, the trapped “Guardians of the Galaxy.” What they won’t know is that Rocket Raccoon has escaped and will enlist the guests to help him break out his comrades. With the crew being held over an abyss however, the Guardians will be dropping out – instead of dropping in. This will be the first stateside Marvel Ride in a Disney Park, with Hong Kong’s “The Iron Man Experience” set to debut in February 2017. A sign posted below has offered a look at the story and show that Guardians bring to the table. While no official opening date has been announced, park insiders place the opening date prior to the release of the film (It makes sense, if you had a major motion picture what better way to promote it then a themepark ride?) Meaning that May 2017 is shaping up to be a very interesting year for Disney’s California Adventure.